Why are bikes sold with crank lengths that are not appropriate for 70% of people? 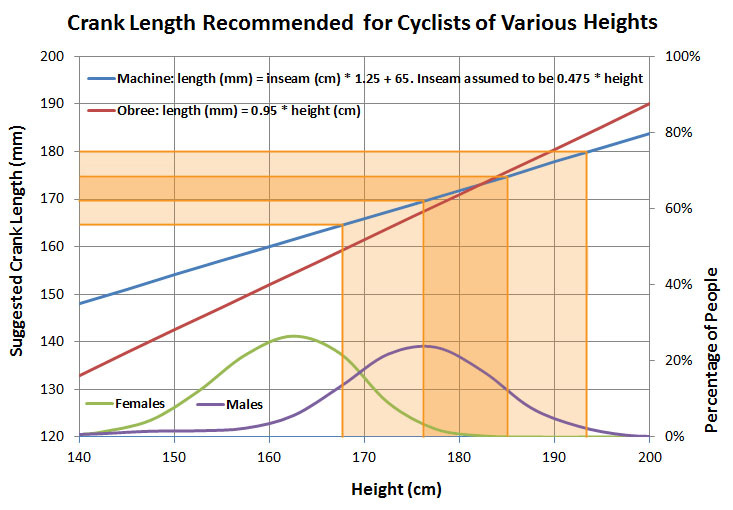 If you are a male whose height is not in the range of 1.77 m to 1.85 m (5’10” to 6’1″) or a female who is shorter than 1.68 m (5’6″) and want to be more comfortable on your bike and avoid over-use injuries then you should read this! Even if you are in that range then the crank length that your bike came with may not be ideal for you, particularly if you like to Ride Far. 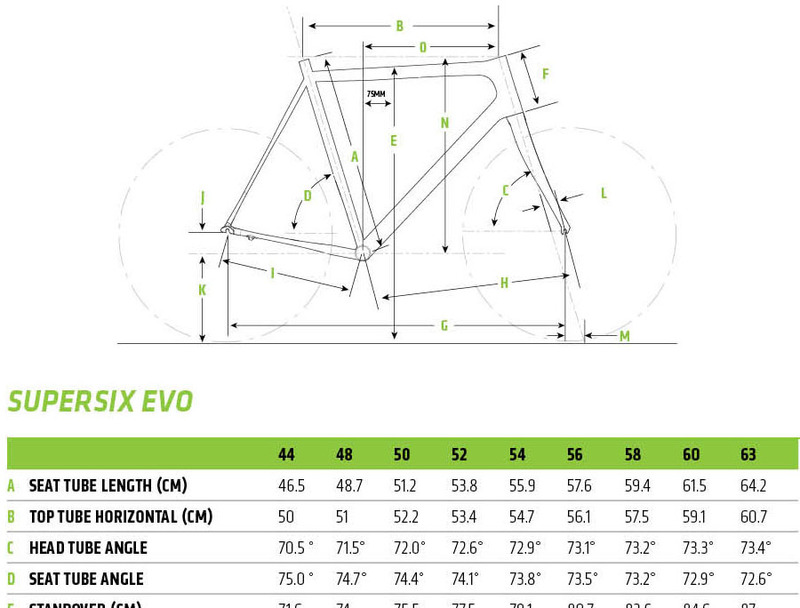 Bike frames are typically offered in a range of sizes from about 50 cm to 63 cm for men and about 44 to 56 cm for women, as shown in the example geometry chart from Cannondale on the right. The largest frame size is therefore about 25% larger than the smallest for each gender, and if we look at distributions of people’s heights then these sizes should cover at least 95% of both males and females. So, why do cranks offered on men’s bikes only vary between 170 mm and 175 mm, a 3% difference, and on women’s bikes between 165 mm and 172.5 mm, a 4.5% difference? Saddle height is covered on the Riding Position page of this website; it is normally set to optimize the extension of the leg at the bottom of the pedal stroke, maintaining a small bend in the knee (often recommended to be an angle of about 30-35 degrees). Crank length then determines the knee angle at the top of the pedal stroke. Even in professional bike fittings, the knee angle at the top of the stroke is rarely measured and few guidelines exist. Why not? If people’s heights, saddle heights, and bike frames vary by 25% then a variation in crank length of 3% may not be sufficient. People shorter than the range that these cranks are suitable for have far more bend in their knees at the top of the pedal stroke than is ideal and those who are taller have far less of a bend in their knees. Using an inappropriate crank length can have a major impact on cycling comfort and may contribute to developing over-use injuries in tendons, ligaments, and the lower back. Are variations in the knee angle at the top of the pedal stroke, and so different crank lengths, important? There has been some research looking at the power output possible for a given individual using a range of crank lengths. The general finding is that a similar amount of power is available when using cranks with a reasonably large range of lengths, and only at the really extreme ends of the scale is a significant decrease in performance usually observed. A lot of people believe that longer cranks = more leverage = more power. This suggests that we should all use the longest cranks possible. The video below includes a discussion of this, explaining that power is determined by torque and cadence; although longer cranks do cause an increase in torque for the same force on the pedals they also tend to cause a decrease in cadence due to the larger pedaling circle. These two factors tend to offset each other, so power is generally unaffected by crank length (but many people fail to understand this because they believe that power = torque). The lack of an effect on power of most intermediate crank lengths is probably why crank length receives very little attention. However, ultra-distance cyclists are not very concerned with how much power they can possibly generate and instead focus on optimizing comfort and avoiding over-use injuries, so how might it affect those criteria? Ferrer-Roca and coleagues published research on the effect of crank length in the Journal of Sports Science in 2017. They concluded that the metabolic costs of cycling didn’t change based on crank length, but long-term injuries were more likely to be avoided by using shorter cranks due to the “maximum flexion and range of motion of the hip and knee joints” being higher for longer cranks. Andy Pruitt is one of the most respected bike fitters in the world and helped to develop the Specialized BG Fit system. Lennard Zinn reported that Pruitt warns that cranks that are too long can cause injuries because “the compressive and shear forces in the knee joints ‘go up exponentially’ due to the sharper knee bend. … Cranks that are too short are not dangerous, however.” In his book Bicycle Design, Mike Burrows warned against using cranks that are too long to avoid knee problems and Sheldon Brown has written about crank length and how riding with cranks that were too long for him caused knee pain. The scratch rate in many ultra-distance bike races is often at least 30%, with the most commonly-cited cause being knee problems. Most of those who do finish report having some knee pain at some point during the race. There are many possible causes of this, but crank length should certainly be a very important consideration for such riders. Experienced riders often report that their knee problems went away when they tried using shorter cranks. Francis Cade has done a series of interviews with an experienced bike fitter in London, who addressed crank length in the video below. He encourages people to experiment and states that using shorter cranks can reduce heart rate, thereby reducing fatigue levels while at the same time increasing comfort due to causing less hip rotation. There is also a bicyclecranklength mini-blog and this page and this one are useful resources on the topic. The method used by Lennard Zinn suggests using far longer cranks than most other sources recommend. The results of the Obree and Machine methods are presented in the graph below, which give similar recommendations within the typical crank length range (170-175mm), but diverge somewhat for shorter and longer lengths. For the purpose of this graph, I’ve assumed that inseam = 0.475 * height, but this won’t be true for everyone, so it’s better to measure your inseam and use the formulas. These equations are not perfect and will obviously not work for everyone, but they give a useful starting point. Sugino (a crank manufacturer) have posted a table that recommends which crank length riders of different heights should use. There are some specific characteristics of long-distance and ultra-cycling that suggests that cranks lengths shorter than suggested by the above equations could be more appropriate. Riding longer cranks causes more knee compression at the top of the pedal stroke and requires a tighter hip angle. The hip angle is a major determining factor on what handlebar height is comfortable and how easy it is to ride on aerobars for extended periods of time, which is something that ultracyclists often do to improve their upper body comfort and aerodynamics (see the Aerobars section of this website). Some triathletes and time trialers are now using shorter cranks so that they can more comfortably have their bars at a lower, more aerodynamic position without their knees coming up too high or their hips compressing too much. In addition to shorter cranks making riding on aerobars more comfortable, several ultra-cyclists have reported lowering their saddle height by 5-10 mm for ultra-distance events compared to what they would use for short rides to prevent ligament and tendon problems, myself included. Having a lower saddle means that the knee is compressed even more at the top of the pedal stroke. These two characteristics of ultracyclists (extensive use of aerobars and possibly a slightly lower saddle height) suggest that ultra-cyclists should certainly experiment with using shorter cranks than would be recommended by the universal formulas above. When trying different crank lengths, keep in mind that shorter cranks encourage a higher pedaling cadence (because people tend to keep their tangential foot speed constant rather than their rotational foot speed). This means that people using shorter cranks are better off with lower gearing that allows them to use a higher cadence when traveling at the same speed as someone with longer cranks. For other factors to consider when choosing gears, see the page on Gear Ratios. Who Are Typical Crank Lengths Suitable For? In addition to the lines for recommended crank lengths, the graph above also includes typical height distributions for males and females. The heights of people who are accommodated by the range of crank lengths that are commonly offered (170 to 175 mm) is shown by the area shaded in dark orange when using the “machine” equation (using the Obree equation would yield an even narrower height range). This suggests that bikes are sold with cranks that are not appropriate for the 50% of males who are below average height (i.e., below 1.77 m or 5’10”) and those whose height is in the upper 20% (i.e., above 1.85 m or 6’1″). Just 30% of males are catered for appropriately. For females, cranks of at least 170 mm are only appropriate for the tallest 10%. Fortunately, some female-specific bikes are equipped with 165 mm cranks, so the region of heights that this is appropriate for is shaded in light orange, but any female who is shorter than 1.68 m (5’6″) is still not catered for, which is 70% of all females. If a crankset is purchased separately from a bike then crank lengths of up to 180 mm are available in certain models. The range of heights that are accommodated by these cranks are also shown shaded in light orange, and this should accommodate taller males except for the upper 2% (over 1.93 m or 6’4″). Shorter males can reasonably easily obtain 165 mm cranks after-market, leaving only males shorter than 1.68 m (5’6″), the lower 15% of the distribution, to struggle to find something appropriate. Even though I’m only discussing crank length differences of maybe 5 mm, it should be noted that if the distance from the bottom of the pedal stroke to the saddle is kept constant (as is normally recommended when changing crank lengths) then a 5 mm difference in crank length will cause a difference of 10 mm in the distance between the saddle and pedal at the top of the pedal stroke (i.e., it’s the diameter of the pedaling circle that matters, not the radius). Most people would consider a 10 mm difference in saddle height to be significant and noticeable, so the same should be true about crank length – 5 mm is already quite a lot. However, many people find it hard to notice the difference if changing their crank length by only 2.5 mm. GCN have made a video on this topic. They present the same formulas as I do above. It’s a good video but you should ignore the graph that they briefly display because their numbers don’t entirely correspond to the formulas that they state. CyclingTips have published an extensive article on the topic of crank length, which includes more useful references, and here is a blog post by a bike fitter listing many examples of clients who came to him with knee problems and he solved the problem by installing shorter cranks. Producing cranks in a wider variety of lengths costs the component manufacturers more money, which is why only the more expensive cranks are available in a slightly larger range of lengths (165 mm to 180 mm, a 9% difference, see the section below for a list of models). In addition, frame geometries are adapted for a narrow range of crank lengths. Ideally, the bottom bracket height and the distance between the bottom bracket and front wheel should be adapted based on the crank length. This is why bike brands are happy with the current situation of offering bikes with a narrow range of crank lengths, because it makes their job of frame design easier and keeps parts costs down. Unfortunately, these cost-cutting methods cause bikes to be sold with cranks that are not appropriate for the 50% of males who are below average height or who are in the upper 20%; and any female whose height is not in the upper 30%. Overall, cranks must be the poorest-fitting part of a bicycle, but this is rarely discussed and bike shops rarely suggest changing it even when doing a full bike fitting. There is certainly some evidence that ultracyclists should generally use shorter cranks than they are currently using if they want to have the best chance of avoiding knee problems. Unfortunately, new cranks are not cheap, but people often buy expensive new wheels for their bike that have a very minimal effect on the bike’s performance or comfort. Most cranks are cheaper than most wheels, so I encourage you to consider this. Personally, I’m 1.73 m tall and was much more comfortable after switching from a mix of 170 and 172.5 mm cranks (which are standard on the 52 and 54 cm bikes that I ride) to always using 165 mm cranks, which I can now see is approximately what is recommended by the above equations. Having got used to the increased comfort, I could never go back to using the longer cranks for the long-distance cycling that I love to do. What we really need is for the industry to recognize that the current situation is not ideal and equip bikes appropriately, so I’m planning to send a link to this post to many of the major bike brands and component manufacturers to try to convince them that they are doing a poor job of accommodating most of their clients. If you’ve benefited from a change in crank length then please leave a comment below because that will give extra support to these arguments. Road cranks that are available outside of the typical 170-175mm range are listed here. Many cranks by the major brands like Shimano, SRAM, and FSA are officially listed as also being available in 165mm, but that length can be difficult to find for sale after-market. Shimano makes Dura Ace cranks in a 180mm version and SRAM offers models at a wider variety of prices up to 180mm length. Campagnolo currently only sells cranks in lengths from 170-175mm. Rotor and Vision offer some shorter cranks due to the recent interest by triathletes. Rotor’s 3D+ and Flow cranks should be available in lengths from 155 or 160mm up to 180mm [update, Feb. 2018: the new Rotor Aldhu 3D+ crankset is available in 150-175mm lengths), and Vision Trimax cranks in 155-175mm. TA Spécialites is well-known for offering a wide range of crank lengths, with the Vega and Carmina models available in 155-185mm lengths. Cranks designed for kids’ bikes are a good source of reasonably-priced short cranks; many of these are very poor quality, but the Stronglight Impact Kid is probably the best of them and is available in 130-155mm lengths. There are a few manufacturers of custom cranks. A super-light carbon option is made by Lightning in 160-190mm lengths. Da Vinci makes aluminum cranks in 120-200 mm lengths and Lennard Zinn’s aluminum cranks are offered in 130-220 mm. Leave a comment below if you know of other options. I used to occationally have knee problems, quite painful at times, with 170 and 172,5mm cranks. I switched to 165mm a few years ago and the problems went away. There might have been other reasons, but I felt this helped as soon as I got the new cranks. At some point I also had soreness on my achilles tendos, pretty bad on a couple of longer rides, that seem to have been caused by having the seat too high, which was partly because of the longer cranks lifting my knee so high so I had set the saddle too high to compensate that. With these 165mm cranks I’ve successfully ridden events like the Transcontinental race and Paris-Brest-Paris. I’m not even that short, about 175cm with 79-80cm inseam. I’m 179 cm. As a young man I rode 165 & 167.5 mm cranks. Coming back to cycling and Audax events in my fifties, I found all bikes offered to me in 172.5 or 175 mm. Bike fitters in shops wouldn’t countenance my insistence on shorter cranks. I could ride, but eventually they gave me hip and neck pain. Once I got my own 165 mm cranks the pain went away, my cadence increased, and I was happy! I’m 6″1′ and frames my size come with 175mm cranks. I got a high level fit recently and it turns out I do best with 165mm cranks. At the same rpe I was turning 5 more rpm and corresponding “free” power increase. I felt like the “dead zones” at the top and bottom of the pedal stroke shrank considerably. I did not want this to be true because it was a fairly expensive change, but switching back and forth on the fit bike made the improvement too obvious and too dramatic to ignore. Very odd that I am taller than average, and everyone’s frame in my size is labeled “large” or “extra large,” yet I get the best fit and a big performance boost with the smallest of the standard crank sizes. Either I am badly disproportioned, or the bike companies are doing this wrong. Hi Anthony and everyone. I will be 70 in July, and had both knees replaced in mid february. I’m 183.5 cms, and was using 175mm cranks on a road bike before my knee op. I could ride OK, but could not walk without pain which was only going to get worse. Following the knee op I restored a single speed bike with a freewheel and 44t : 18t ratio, and with 28mm 700c tyres. It gives about 65inch gearing. The old single speed was a geared city road bike with 27″ wheels and 1.25″ tyres when I bought it in 1982, so it was a real “clunker” with chrome moly frame. I first used 48t : 18t for 72inch gear with 170 cranks in 1988, and I could outride many ppl with gears anywhere around my town Canberra, in Oz. But 12 weeks after the double knee op, my max right knee bend is not enough to pedal comfortably or quickly with 170 cranks so I changed to 160 cranks. This effectively raised the gearing because there’s slightly less lever length which matters most when slowly going up climbs less than 4 degree incline. Until I recover better, I will try to keep to nearly flat roads. I’ve also found I had to raise my saddle about 30mm and I have to turn foot slightly down to get around bottom of pedal stroke while turning foot up to minimize knee bend when going over the top of pedal stroke. I also moved my saddle back 12mm with some slight filing of the old seat post top clamp. I replaced Cinelli criterium bars with cow horn type, and now find I need to reduce the reach forward stem with adapter for steel frame and an adjustable stem to get bars 50mm higher, and 50mm back from where they used to be. They say youse ain’t ever too old to ride a bicycle, but after a double TKR youse begin ta wunda. You see, I might marry one of my bikes one day, and the simple reason why is that I can go fer a ferkin ride any old time I ferkin like, providing I get the right cyclometrics that suit my condition which reminds me that the “olda ya get, tha betta ya woz. Let’s face it folks, comin’ down hill on a winding country road on a bright spring morning is heaven, no? Patrick T.
I developed knee pain on one side after a long mtb bikepacking race. I’d switched to 180mm cranks about 18 months previously with no issues including 9 hour races. The knee pain would die down after about 6 weeks but has come back twice after overdoing it a bit in group rides. Now the mtb has 175mm cranks and things seem better although the road bike is still on 177.5mm. I intend to go down to 175mm on the road bike too. I’m 195cm tall and I thought long cranks made sense, but obviously not! I’m 5’10” with some fairly long legs. My inside leg is 88cm or about 34.6” I think. I ride a custom road frame that is 56.5cm seat tube, 55cm top tube, 73.5deg st angle. Most production road bikes that can be fitted to me not only require too many headset spacers and a stem shorter than I prefer to ride, but they come with either 172.5mm or 175mm cranks. When I was teenager, my first road bike was a 57cm Raleigh that had 165mm cranks. All of the racer guys at the shop told me that I needed 172.5s, but I had no problem keeping up on the hills or anyplace else for that matter. At some point in my twenties, I began riding 170s and have continued to do so for most of my life without much noticeable difference in my performance one way or the other. When I was in my fourties, a friend gifted me his barely used Dura-Ace 172.5mm crankset. My cadence with those was noticeably slower and I could feel the increase in knee strain. I tried to tough them out for a while. Kept telling myself that I would adapt. After two years, I sold that crankset. Never got used to them. Went back to 170’s. Now in my 50’s and lately my knees have become somewhat sensitive to the hill country, I decided to try dropping down to where I began, on 165mm cranks. Hallelujah! No more knee pain. With the slightly more open hip angle, I can spend more time in the drops too. I work in the bike business. I have been performing bike fits since 1987. I started with the FitKit system, the FitStick, taken a yoga-based fit class, performed many dozens of BodyGeometry fits, and now work with the Retul system. I think that the big bike makers ought to consider looking at the spec of every size adult bike they sell and shortening the crank length by at least one size. And the big component makers should bring back 165 and 167.5mm road cranks at every price level. Also more bike fitters ought to include crank length options into their assessments. Thanks for sharing your experience, Art. I’m glad that the shorter cranks solved your problems. The fact that the major brands and most bike fitters generally ignore crank length bothers me also. I need a shorter left crank arm due to leg shorter from accident. 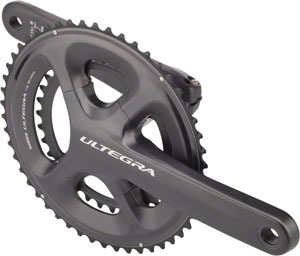 I have a Shimano ultegra crankset. Looking for 140 mm length. Any help out there? Shimano cranks aren’t available in anything less than 165mm. If I wanted such a combination, I would look at getting a TA square-taper crank, but for that you’ll need a frame with a threaded bottom bracket or one that can be converted to take a threaded BB (e.g., a threaded insert can be put into a BB30 frame). Total height has nothing to do with what length crank is appropriate for a given individual. It’s all about how long one’s legs are. Statistically, most “tall” men have a long torso and (I suspect) a very average inseam of 30-32 inches. Thats why 165-175 mm cranks work for most people. But what if you’re one of those that can’t get their legs in behind the row of seats in front of you in a cinema? Or fit your legs in a car because that dashboard is just too close? Then go sit on a bike and try to get that seat back far enough and further fold your legs to minimize pedal strike. You’re almost on top of the rear axle and there is simply no place further back to go. What does one do with a 38.5 inch (978mm) inseam? Well, a 200-210mm crank is a great place to start. Proportionally, 200-210 cranks are equal to 165-175 cranks when a 32” vs 38” inseam is compared. I’m 194 with a 95 inseam, and switched from 172.5 to 177.5 cranks. I felt the smaller cranks were not optimal, however my hip mobility on the right side is not quite there yet when riding in the drops with the longer cranks. All the calculators above suggest far longer cranks for my inseam, so I’ll continue with what I have for now and work on my hip mobility, but if any issues arise I’ll just bite the bullet and go to 175 cranks. Thank you for this wonderful website by the way, it’s an invaluable resource for those interested in endurance cycling! The Sugino table that you’ve referenced has an error (URL: https://www.suginoltd.co.jp/us/products/accessory/images/chainring-message.gif). The ordinate axis units (for height) are listed as “mm”; I think they should be “cm”. Thanks, I had given two link to Sugino, the first one was to the general brand website and the second specifically to the table. The link to the table is still working, so I’ve just deleted the first link so that people cannot click the wrong one. You are obviously correct that their table is mis-labelled, but I doubt that they will correct that even if you ask them to. I’m building an entirely new bike specifically for riding far. I’ve always used 172.5mm cranks (172cm tall and 82cm inseam) and have never had any significant, lasting knee or hip issues (a crash caused hip pain for a few weeks, and the knee issues have usually been the result of fore aft position being incorrect.) As I’ve upped the weekly mileage and started increasing the number of long rides I do (preparing for IndiPac) I’ve become more aware of the how some small problems become big problems over multiple days. Because I now have the option to choose any crank length I like, I was wondering whether it is a blanket rule that one should go to 165mm cranks for this discipline? There is certainly no “blanket rule” or advice that works for everyone. I originally wrote this article to emphasize that the range of crank lengths offered as standard is not sufficient and causes many people who are not in the middle of the range in terms of western males may not be catered for very well. I then discovered how many ultra-distance cyclists have found that shorter cranks helped them to avoid or were a solution to certain joint problems. I would certainly recommend experimenting with it, but I also wouldn’t want to change many things too close to your big event without having the chance to properly test them. It sounds like you understand all of the possible benefits and caveats so the decision is now yours to make. Thanks for your sage advice Chris. The Obree and Machine formulas place me on a 165-167.5mm. There seems to be a lot of internet people in my size bracket who all seem to be happy moving down to 165mm and very few happy moving the other way. The balance of evidence seems to point toward far more comfort with little drawbacks. I think I will end up going with the shorter cranks. I will stick with longer cranks on my road bike as that position doesn’t seem to promote as acute angles. When using aero bars for days on end, it makes sense that creating that sharper hip angle will eventually lead to some overuse discomfort. The reason I stated it as a blanket rule as such was more from an efficiency standpoint rather than fit. Using shorter cranks and thus using the muscles in a shorter range of motion seems to be more efficient (from the data on oxygen consumption). Oxygen demand could loosely be tied to the amount of fuel being burnt and therefore making better use of this resource. With respect to your polling of Ultracyclists, I wondered whether there was an age discrepancy. I notice that many of the people who express satisfaction with the change to shorter cranks also like to mention that they are “getting older”. Very good valuable info. This brings up one question, for me. Is there any correlation between maximal cadence and optimal crank arm length ? I mean if I can make 202 RPM with 175mm crank length, does it mean, it’s not a good idea, to go shorter? Because, I already tend to ride in high cadence 100-105rpm in cruising speed. Perhaps I will benefits from longer cranks, from this point of view? Or it is totally wrong idea ?